The “Sprinkler” is a heat sensing device. Sprinkler Systems are of various types, temperature ranges and designs. The heat sensing element (of the Sprinkler) is pointed to the floor or to the area most prone to fire. The other end of the Sprinkler is connected to a network of pipes storing water under high pressure. Usually from 7bar to 10bar.When there is a fire, near a Sprinkler; whose temperature is higher than the temperature rated value of the, heat sensing element in the Sprinkler. The bulb present inside the Sprinkler, or the heat sensing device bursts and water now flows through the Sprinkler Systems under pressure directly on to the fire affected area.All of this is automated and happens, within 3mins, of the fire being detected. In this way Fire Protection Sprinkler System is an automatic, Fire Detection and Extinguishing System. However, Fire Sprinkler Systems was originally meant for Fire Suppression only. With rich industry experience, we are engaged in offering supreme quality Fire Fighting Sprinkler Systems. Manufactured using high quality raw material and advanced technology, these sprinkler systems are commonly used to discharges water when the effects of a fire have been detected. 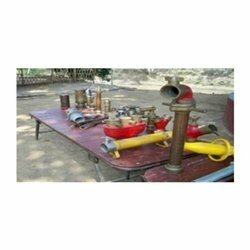 These sprinkler systems are applicable in fire brigades as basic firefighting equipment. 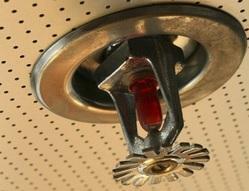 We offer these Fire Fighting Sprinkler Systems in various sizes as per the needs of clients. 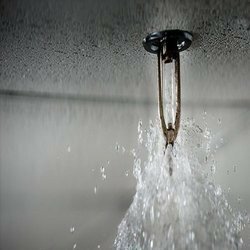 We are among the most trusted organizations in the trade and retail of Industrial Fire SprinklerSystem. Offered in various specifications and technically effective range, these industrial fire sprinkler systems are mainly used to douse accidental fires. Easily installed within least amount of time, these industrial fire sprinkler systems could be maintained quite easily with the support of the water supply. Looking for Sprinkler System ?